First of all, Happy New Year, everyone! Hope your 2017 is full of excellent gaming, good friends, and completed projects! On the “completed projects” note, I get to move my first completed project of 2017 off my bench and into my scenery boxes. 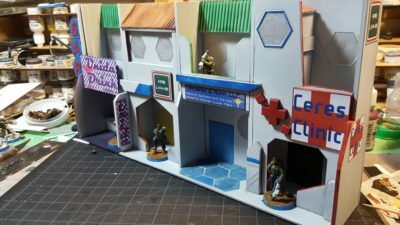 I’ve finished painting and adding signs to the habitat module facade I started in November. Painting in progress on the hab module, 27 December. Click for larger. I added various spot colours of paint here and there, some hex floor tiles in front of one of the doors and a small auto-bar setup to one module, and a few window frames and other small details. Almost all of this detail was done with scrap card or plastic offcuts. The “BAR” sign on the left is held on by a rare earth magnet embedded in the wall and another built into the frame. I printed the letters off on my computer, glued them to thin plastic card, and cut them out carefully by hand, using sandpaper and files for cleanup. The hexes are from a 1″ hex punch I bought at a craft store; the frame behind them is an offcut of 1/8″ foamed PVC plastic board. It’s double sided; the other side is identical. After painting it was off to the computer and Inkscape to create a set of signs for the three commercial modules on the ground floor of the unit. The bar is “Unida Drink”; there’s a legal firm, and then the Ceres Clinic on the far right. Signs identifying this as Hab LV4-26 are on either end and above the main entrance with the hexagonal outer wall. Hab Module LV4-26, left end. Click for larger. Hab Module LV4-26, right hand end. Click for larger. I’ve included (Google Translated!) Arabic and Simplified Chinese text on quite a lot of the signage I’ve created for Infinity; the Arabic and Chinese text on the Unida Drink sign reads, “You require a drink”, ie a literal translation of the English-language pun in the bar name. There’s some Spanish on there too, for fun, which reads, “Your mom drinks here”. I might yet create a second hab module (LV4-28, perhaps?) as this one was fun to do, should be tactically interesting on the Infinity table with the balconies and doorways, and they’re an awesome source of colour and a lived-in look for a table. Need to come up with some more weird/interesting/cyberpunk-ish names for businesses! In the next couple of days I’ll be publishing a PDF so anyone can build a small craft airlock for their science fiction gaming, and then it’s off to other projects, including getting back into some pulp scenery building in advance of 2017’s local wargaming convention season! Between the Christmas season and what appears to be the worst cold I’ve had in many, many years there’s not been a lot of wargaming activity here at Chez Wirelizard. 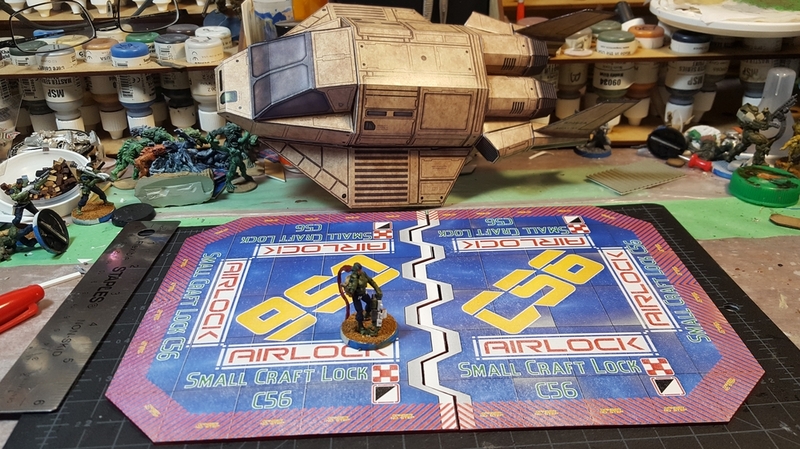 I did manage to spend one sickie evening messing about with Inkscape and created a nice floor airlock piece to add some colour to the space station. The inspiration is one part from aircraft carrier’s giant elevators and one part from science fiction (so far, least) giant cargo airlocks. The size is fairly arbitrary, 10″ long by 7″ wide, big enough to hold either of the papercraft spacecraft I’ve built recently. I started the graphic as one big piece in Inkscape then split it into two doors, printing each on a single letter-sized sheet of paper. I did a sort of blue/grey/black background with lots of hazard stripes, labels, and ID tags all over. The two door graphics got printed on full-sheet sticker paper, stuck to mattboard, then cut out. I coloured the cut edges of the paper & card with a red Sharpie pen. Airlock doors with Muyib ignoring all the warning signs and walking across them anyway… Click for larger. Percheron shuttle on the doors – just long and wide enough! Click for larger. These pieces are usable as-is on the Infinity table, but the next plan is to do some edge or frame pieces to go around the doors, provide some actual cover to Infinity troopers, and add some more interest to my space station. I also have an entertaining plan for showing the open airlock when the doors aren’t closed, but stay tuned for that! I’ll also get the airlock door graphics cleaned up a bit and save them as a PDF if you want to print your own. Back on a holiday note, I hope you had a satisfactory Christmas or whatever mid-winter holiday you celebrate, and a good New Years too! Infinity has really interesting terrain rules, but they’re an added layer of complexity over an already complex game so they often get ignored. 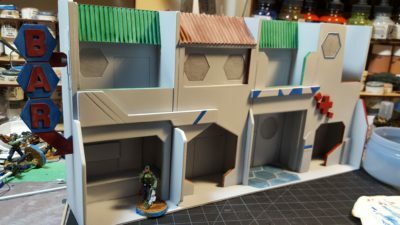 The “default” terrain for Infinity is urban, generally, and doesn’t use any of the terrain rules. That’s a pity, because skills like Multiterrain and other movement skills only earn their keep and become interesting when you actually use the various terrain rules. To hopefully encourage use of the terrain rules I’ve been working off and on on a set of Quick Reference Cards, and I’m finally getting around to publishing them here. The PDF below is four pages with 19 cards in total. There’s a card for every terrain type in the terrain table in the main N3 rulebook, including one for the Storm effects; a card with a quick ref version of the Hostile Environment rules; a set of four blank cards for filling out with custom terrain types (as the book encourages players to do); and then a set of cards with each of the four Visibility Effects, two Movement Effects, and two Saturation Zone Effects that make up the terrain rules, so that you could create any combination of them quickly for custom terrain. They’re sized to print eight to a sheet and should print out to the same size as Magic cards or other standard game cards, so you can put them in regular sleeves if desired. I’ve done up both Letter-sized for those of us here in North America and A4 for anyone living where they use rational paper sizes. Infinity is © Corvus Belli; these particular cards are © 2016 Wirelizard Design/Brian Burger; Permission is granted to print, copy, or reproduce for personal use. If you have any feedback or suggestions to improve these cards, please leave a comment below or use the contact form elsewhere on this site. Suggestions always welcome! Finally got a sheet done with most of my Blood Bowl sideline ads to date, arranged in strips and sized for 1″x3″, which is a good height for sideboards or hoardings. There’s a mix of Blood Bowl-inspired ads, almost all parodies of real products. There’s Haterade, Croak, Plopsi, Goblin Sweat, and DorfAde (in new Stunty Tears flavour!) for starters, as well as the Necromancer Beer ad I’ve posted previously and a Blood Bowl ad/joke. 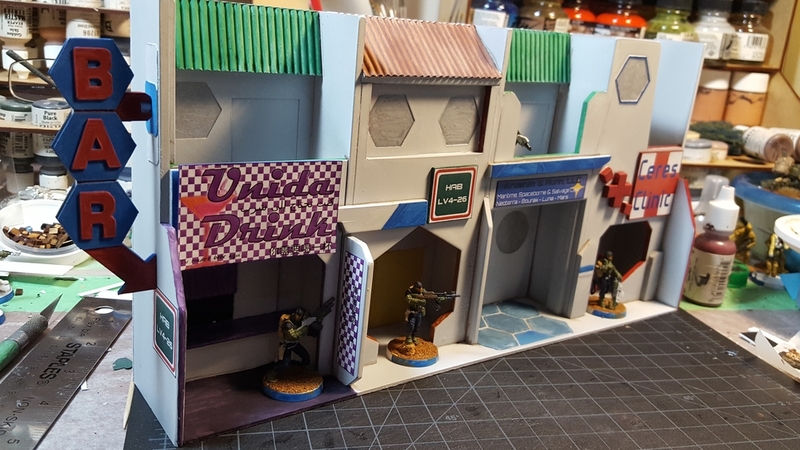 Later on I plan on doing different sized/differently proportioned versions of most of these, but I needed 1″ tall for the sideline scenery I’m currently building so here it is! These are all my own work; I’m sure some of the ideas or parody names have been done elsewhere by other members of the BB community but these versions and this artwork is all my own. Permission is granted for personal, non-commercial copying or printing. Enjoy, feedback appreciated! Yeah, so this one is based on a very, very juvenile joke. I’d apologize but I wouldn’t mean it! It’s also smaller than some of my other recent graphics, designed to print at roughly business card size (2.25″ x 3.25″) to go over the backing cards used in the Infinity blister packs, which I’ve been reusing as billboard surfaces. 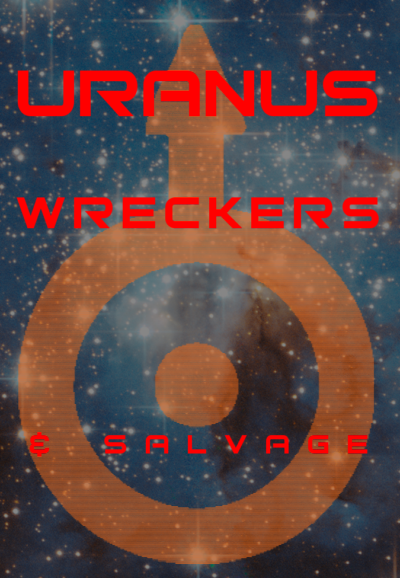 Uranus Wreckers & Salvage. They’ll fix your pressure vessel, all right! Click through to grab the full-size image from Imgur! Everyone’s favourite terraforming/engineering/evilevilevil megacorp needs a giant billboard ad too! Third and (for now) last of my big 3″ wide by 5″ tall 300dpi ads. This one is also released under a Creative Commons CC-BY-SA License. 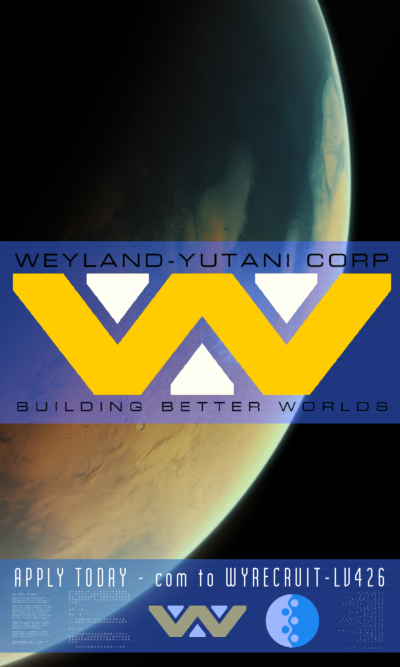 Weyland-Yutani looking for recruits to some place called LV-426. What can go wrong? Click on image to grab the full-sized image from Imgur! Mars image via Wikipedia, released under a CC-BY License. Weyland-Yutani image redrawn in Inkscape from various images found online. 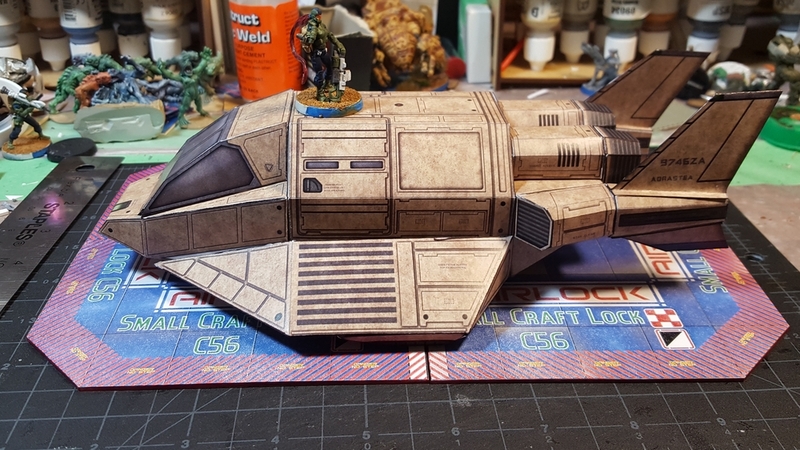 Borrowing from another popular science fiction universe to provide some graphical fodder for Infinity terrain, here’s another big (5″ high by 3″ wide, as designed) advertisement. This one is being released under the CC-BY-SA License for reuse as you please. 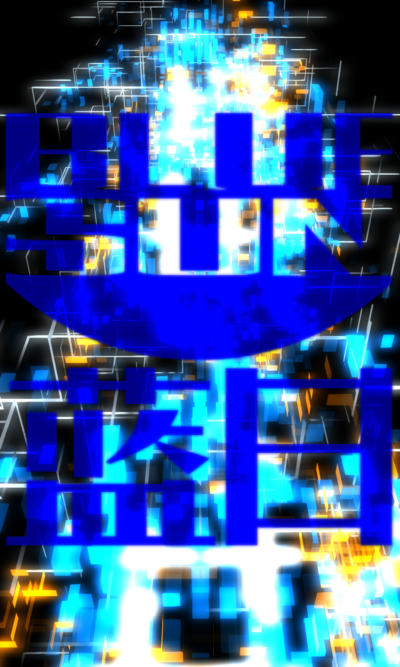 Blue Sun Corporation ad, designed to be printed at 300dpi, 3″ wide and 5″ tall. Click through to get the full-sized, much more detailed image from my Imgur account. Background graphic from monaeberhardt on Flickr, CC-BY-SA. Blue Sun graphic redrawn in Inkscape by me from smaller images found on the web; original is copyright Josh Wheadon or whichever studio produced Firefly. I’m home with a stubborn cold that won’t go away, so decided to kick GIMP and Inkscape to life and create another couple of billboard-sized ads for my Infinity terrain. 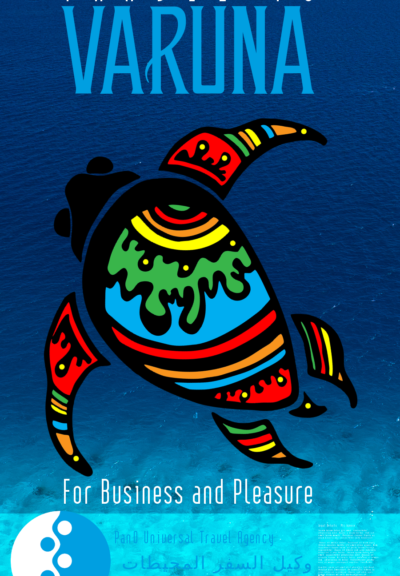 Here’s one advertising the PanO ocean world of Varuna as a travel destination. It’s available under a Creative Commons BY-NC-SA License for (limited) reuse. 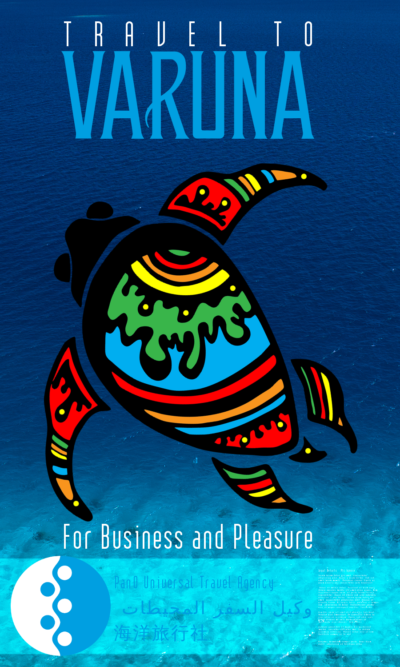 Travel To Varuna – click through to my Imgur account to see the full-size PNG file. Designed to print at 3″ wide by 5″ tall at 300 DPI, hence the size. Sources: Tropic water background via Flickr user tahitipix, CC-BY-NC-ND Licensed. Turtle Clipart via the OpenClipArt Project, Public Domain Licensed. PanO logo by Vyo from his awesome Infinity Logos in Vector Format project. Infinity has, for most troops, a 180° front arc for Line of Fire and almost all actions. Other games have similar arc requirements – Full Thrust uses six 60° arcs on it’s starships, for example. To help me do the 180° arcs on my Infinity bases, I’ve whipped up a simple little measuring widget in Inkscape. The two PDFs below (one Letter, one A4) are designed to be printed out to help with marking arcs on the bases of figures; there’s four quadrants for 90° or 180° marks and Full Thrust/hex-side 60° lines as well. The rings are to help centre your bases accurately; they start at 20mm and go up by 5mm then 10mm all the way to 60mm; the rings are 20mm, 25mm, 30mm, 35mm, 40mm, 50mm, and finally 60mm. 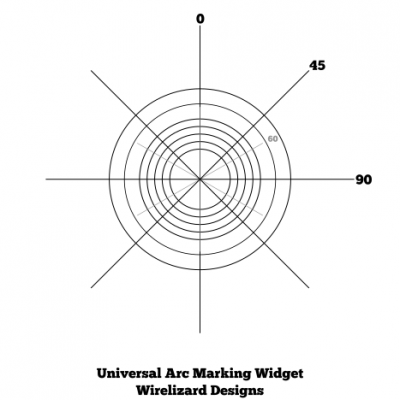 Arc Marking Tool – grab this graphic or the PDFs linked to above.